Alexandra Etienne and Kristijan Ristovski join the conference lineup. While nearly four weeks have passed since Generate London 2018 first launched and the early bird tickets have now flown the nest, that doesn’t mean there isn’t still plenty of news landing about the web-design conference. Case in point: we’re pleased to announce some of the latest speakers to be confirmed for the event. Hosted at the Royal Institution, the home of the Christmas Lectures, from the 19 - 21 September 2018, Generate London 2018 offers a day of workshops and two days of conference talks from truly world-class web designers. An AR/VR evangelist working with Lightform, the Californian startup creating the first computer built for projected augmented reality, Alexandra is on a mission to share AR.js with the world. The AR.js project allows people to easily create AR on the web, enabling them to tap the enormous potential it has for areas like history, education, science, retail and gaming. That’s why, in her talk AR.js – Efficient Augmented Reality for the Web, Alexandra will show the advantages that web-based AR can bring, what others have created with it in and what you can do with AR.js library. Better known by the moniker Kitze, Kristijan founded React Academy to teach the framework around the world and launched sizzy.co and ok-google.io, both of which skyrocketed in popularity within the first week of launch. With such an extensive knowledge of frameworks, it’s hardly surprising that Kitze’s talk will focus on helping Generate attendees pick their way through the crowded and often innovation-obsessed framework landscape. Do you have enough time to learn the latest version of your favourite library? Should you stick with what you know? Should you forget about what you are using and start learning something new? Or should you follow the crowd? So many decisions to make – but in his talk Navigating the Hype-driven Front-end Development World Without Going Insane Kitze will help you find the answers. 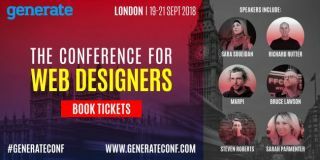 With such a fantastic lineup already confirmed and more excellent speakers still to be announced, demand for Generate is really heating up. So if you want to be sure you can secure your place, make sure you buy your ticket now.